Volunteer & help support Camp Esquagama through building new fun activities and getting camp ready for the summer! 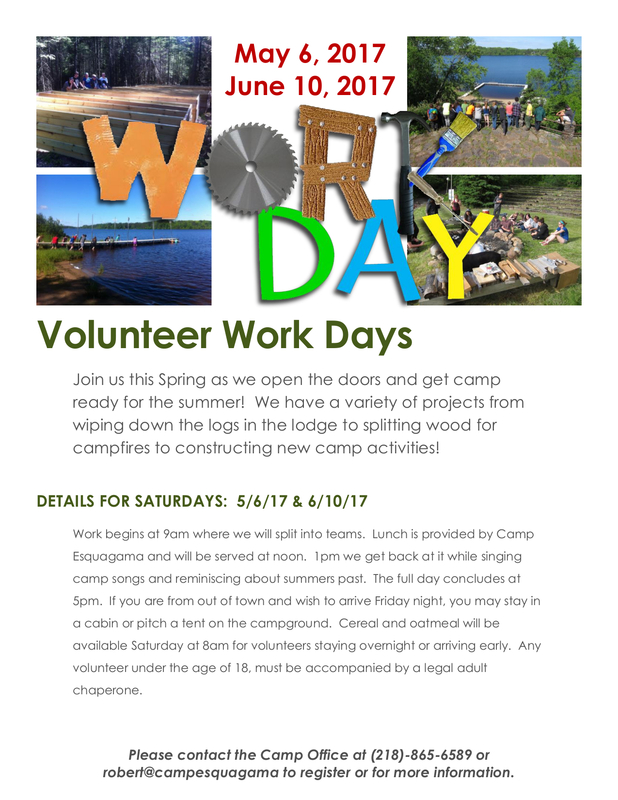 Join us this spring as we get Camp Esquagama ready for Summer 2017! We have a variety of projects from wiping down the logs in the lodge to splitting wood for campfires to constructing new camp activities! Work begins at 9am where we will split into teams. Lunch is provided by Camp Esquagama and will be served at noon. 1pm we get back at it while singing camp songs and reminiscing about summers past. The full day concludes at 5pm. Contact the camp office to register! There is no online registration. Instead, please contact our Camp Office at (218)-865-6589 or robert@campesquagama.com so that we may have you listed for the day(s) you wish to join us. If you are joining us from out of town Friday night and need a place to stay, our cabins will be available as well as the land sports field if you wish to pitch a tent instead. Cereal and oatmeal will be available Saturday at 8am for any volunteers who stayed overnight or who arrived early Saturday morning. Volunteers under the age of 18 must be accompanied by a legal adult chaperone. We have projects both indoors and outdoors as well as projects with differing levels of physical activities. What if I need to leave early? No problem. If you are only able to come out for a couple hours, then you have already made our day thanks to your motivation to help out the camp. Can I bring a group of people? Yes you can! Go ahead and organize your book club, youth group, scout troop, lodge members, or family friends to help out. The more hands we have the more we can get done! If you wanted to organize your group for a separate time to come and volunteer out of the kindness of your own hearts or to earn service hours, just give us a call at the camp office (218)-865-6589. Will there be other Volunteer Days in the future? Yes! 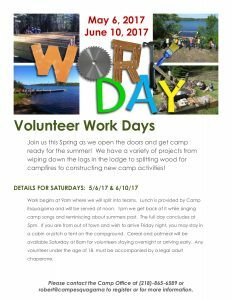 We are planning on volunteer day in the fall to help us put summer stuff away and get camp ready for fall, winter, and spring activities. You can also contact us about organizing your own private group volunteer day if you want to help out or are looking to earn some service hours. Camp Esquagama is a non-profit 501(c)(3) organization. ©2019 Camp Esquagama | Minnesota Web Design by W.A. Fisher Co. | Report problems to W.A. Fisher Co. Please be patient while we process your registration.